Anybody that's ever been written about in the newspaper knows that things frequently don't come out quite right. It can be as simple as messing up the cast list from the school play, or spelling the second baseman's name wrong, or misattributing a quote or misstating what year you graduated from college. If it can happen on that small level, imagine the misrepresentations that must befall those who live their lives in the spotlight�everyone from Richard Nixon to Hillary Clinton to Curt Schilling have accused members of the media of lying, of making up stories, and while it's close to impossible to prove a negative, no one has ever demonstrated that they're wrong. So when Stephen Glass, star reporter for The New Republic, went down in flames a few years back for making up his stories, the reactions were varied, ranging from the incredulous to I Told You So to: This is going to make a great movie. Shattered Glass is not that movie. In fact, it's incredibly frustrating to watch, because you sense the opportunity being botched before your very eyes�with this kind of rich, ripe, pungent source material, screenwriter and director Billy Ray has made something that's clumsy, obviously moralistic, misguided about the ways of journalism, and frequently patronizing to his audience. It's a great shame, too, because telling Glass's story, one which was preceded by Janet Cooke's and followed up by Jayson Blair's, could have been the chance to make one of the best media movies of all time, in the tradition of Sweet Smell of Success, Ace in the Hole, and especially All the President's Men. Things start badly, with a hastily thrown together framing story: young Mr. Glass is revisiting his high school, with doe-eyed teenagers staring at him woozily, as if he were a rock star or a power forward. Glass is a reporter at The New Republic, quickly gaining a reputation as the go-to guy in Washington�he seems always to be at the right place at the right time, to get spectacular, funny, moving stories that elude everybody else. It allows him to start moving up the journalistic food chain: he's contributing to Rolling Stone, to Harper's, to The New York Times Magazine. How is it that he's always a beat ahead of every other reporter, when there are thousands of them swarming all over our nation's capital? Because he's writing fiction, that's why. Nobody in house is onto him, because his stuff is so good, and because they're all won over by his act�he's a liar and an operator in the guise of a little lost puppy. Sniffing him out, though, is a reporter from Forbes Digital Tool, the online branch of Forbes Magazine�a Forbes editor wants to know why his own reporter didn't get on Glass' great story about a convention of computer hackers, and some fact-checking of that story reveals that Glass has been shoveling it liberally for a good long while. Among the many bad choices that Ray makes is not getting us inside Glass' head. The main character of the piece remains opaque throughout�why does he lie? What's in it for him? Not only are we clueless about his motivations; we're never shown the tangible rewards. One of Glass' colleagues asks another: "Did you see all those editors at the correspondents' dinner circling him?" No, she didn't, and neither did we. Ray should be showing us, not telling us; and his narrator isn't unreliable, he's no narrator at all. This isn't Stephen Glass as Kayser Soze, because we take no pleasure in his fictions�Hayden Christensen is game in the role, but he's got nothing to pitch to us. Better is Peter Sarsgaard, as Chuck Lane, the editor who ultimately roots out Glass' fabulism; better still is Hank Azaria as the late Michael Kelly (he was killed in the war in Iraq), as Glass' first editor and journalistic rabbi. But these couple of good performances can't make up for the script and story problems. The movie exists in a hermetically sealed world, in which the titles of Glass' articles (Hack Heaven! Monica Sells!) are read off as if they were greatest hits on a jukebox; out of context, they're meaningless. Ray makes it clear what he's going for from the jump, when Glass mentions Woodward and Bernstein in his opening speech�they were uncovering the secrets of a corrupt administration. What's being uncovered here is little more than inside-the-Beltway solipsism, without any sort of organic understanding as to why Glass could get away with this, why in fact he was rewarded for his bad behavior, and why not much has changed. The perils of fact-checking, the reliability of online journalism, the trustworthiness of reporters, editors, anything we watch on television that passes as news�there's a great movie still to be made about all this. 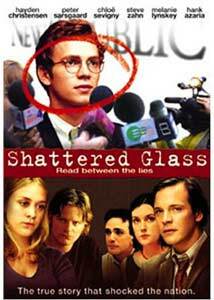 Ultimately, though, Shattered Glass isn't nearly as entertaining as even a single one of its main character's fictions. Image Transfer Review: The film itself seems not to have been shot too badly, but lots of dirt and debris have been introduced in the transfer, which is a very, very sloppy one. Colors are fair, but you may find yourself wanting to reach for the metaphorical Windex. Audio Transfer Review: The 5.1 track is largely free of hiss and crackle, though the balance between dialogue and the film score is frequently tilted inappropriately in favor of the latter. Extras Review: The movie is infuriating, and the commentary track only ratifies that. The writer/director is joined by Chuck Lane, Glass' actual editor; Billy Ray gets most of the air time, and he's full of self-congratulation. The film and the people who worked on it are routinely and frequently described as: "fantastic," "extraordinary," "brilliant," "thrilling," "beautiful," "wonderful," and "outstanding." It's nice that he thinks so; but he should save this talk for the wrap party. What's fascinating here is what he glides right over, what he unwisely left out of his script: at one point he alludes to Glass' girlfriend at the time. Where is she? Lane chimes in occasionally, and he's respectful of Ray, but the best stuff he has to say comes from his own experience�I especially appreciated that he used Bill Bradlee's memoir and its section on the Janet Cooke case as a playbook for how to deal with Glass. You'll find the pair of trailers under the Lion's Gate logo, and also on hand is a piece (12m:36s) on Glass that ran on 60 Minutes; Glass himself is interviewed, and while he's there to shill his own book, Steve Kroft gleans more insight from him in a couple of minutes than Ray does from his story in an hour and a half. The injury is that this film isn't very good; the insult is that the filmmakers think it's brilliant. This is a story worth revisiting at another time, in another movie; but do yourself a favor and go rent The Insider or All the President's Men instead.